By LUDWIG VON KOOPA - This could be a new IP... via self-fulfilling prophecy. Note that ニンゴジラ doesn't appear, so that's a fanon name. So... is it a new IP or something? 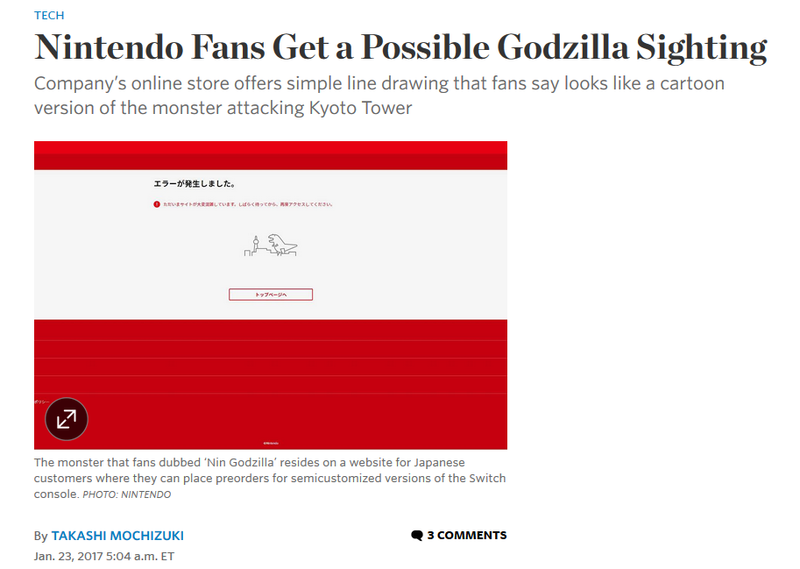 The trade-off of “Nintendo Fans Get a Possible Godzilla Sighting” versus “Possible New Character Is Teased by Nintendo” is that it's unclear why this gets to make the business section of the paper, since this isn't exactly newsworthy. Not that the Wall Street Journal writes a new article every time a new Nintendo character is introduced to the world, which is something we've done with better dragon/dinosaurs than Nin Godzilla, such as Turtonator. The article further suggests the existence of pretentious “Godzilla fans” stating that the dinosaur looks nothing like Godzilla. My first thought is that it's Ice Dragon from the Kirby series, but Ice Dragon has spikes down its back and Nin Godzilla does not. Regardless, the Japanese are known for weird meme creations inspired by unfortunate circumstances, and in this case, #ニンゴジラ was trending and is filled with interesting fan creations for Nin Godzilla. This includes a browser-based game, playable here, featuring Nin Godzilla running from right-to-left while either burning down buildings or jumping over them. Here is my expert opinion, as someone who would know all about Nintendo characters (if you don't understand why I would say that, think smarter, not harder): Nin Godzilla is not going to be some new intellectual property with a whole series. He was never meant for that. The dude is just around to be an error message scribble made in a few seconds. It was either that, or put a picture of a Nintendo character facepalming or something. It'd be nice to know what error message existed prior to the Nintendo Switch existing. That said: Now that people THINK Nin Godzilla will be his own character, Nintendo has little choice but to put him in some game to placate this new fanbase. Maybe he'll be in a new BoxBoy! game, or it'll appear in some obscure level in a Snipperclips-esque game. Perhaps, going back to the Kirby series, Nin Godzilla could appear as a background character in the next Kirby game. Hey, it wouldn't be unheard of for Nintendo-making-something-and-fans-make-a-bigger-deal-than-intended-so-Nintendo-references-it-later to happen. Luigi's Death Stare got referenced in Paper Mario: Color Splash, after all. Continuing obscure side-stories with minimal effort is kind of fun, isn't it? KoopaTV is all about continuing its own obscure side-stories and tangents from article to article, and you can't predict when it'll happen. You better read all 1,000+ articles on the site, then! When you're finished with that, let us know what you think of Nin Godzilla. ...If anything. The Wall Street Journal obviously used this as filler, and so will KoopaTV! For KoopaTV's own fan-based browser-based games, click here for a whole list of them! Japan-centric stories like this is exactly why KoopaTV has been asking for someone to be our Japanese Marketing Manager for exactly three years now (give or take two days)! KoopaTV is hoping for clueless Live Chat Paratroopa to also get his own game. I think it's supposed to be a reference to Google Chrome's offline dinosaur game. 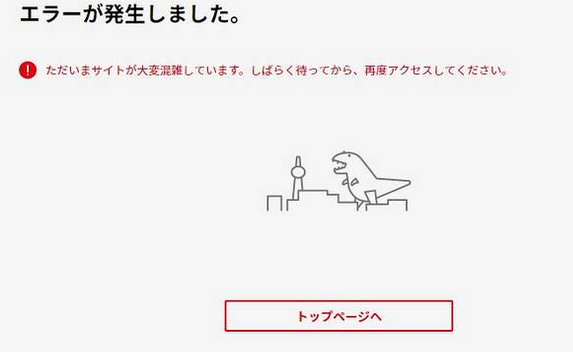 Aren't isolated, stranded dinosaurs usually represented to identify server shutdowns, though? Such as, as stated by Kody, in Chrome? Besides, dinosaurs are starting to "die no~w" as we speak! Nin Godzilla does look like a Japanese version of it.